The Sun and the Moon are crossing each other in your first House in April; you are then the center of attention, that's why you should take care of your look and show what you are worth, at least starting 5 because people will start paying attention to you! You'd rather isolate yourself in order to be more receptive to your needs but also to other people's needs. Mercury is giving you a lot of confidence, communication with others is made easy because people are receptive to what you say. However make sure you find a balance! You are on a roll at work thanks to Mars in third solar house. It's time to give even more...and more! Pluto is in harmony and you will have a brand new faith that will boost your life with a new strength. Give more affirmation and boldness to your creativity. Jupiter is in dissonance with your Sun and you will only rely on yourself when you actually needed to spend a lot of money! 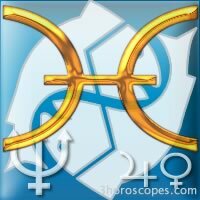 Saturn is in harmony and you may be satisfied on the social or administrative plan. If you ask for it, you may be helped by very important people. During the week of 7 you will make important contacts because there will be a transit of Mercury across your sun. You will take risks and it's a total success, especially in the fields of communication and trade. During the week of 14, Venus is in transit to natal sun. Your partner is sensitive to your charm and may invite you for dinner or give you a gift or compliments.